You must make reservations at least 5 minutes in advance of the time at Bluefin Sushi Thai. 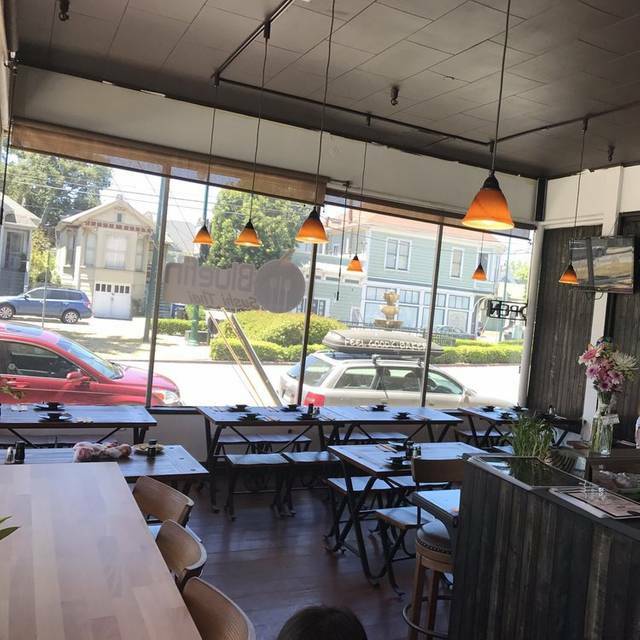 Bluefin Sushi Thai looks forward to welcoming you in our bright dining room. 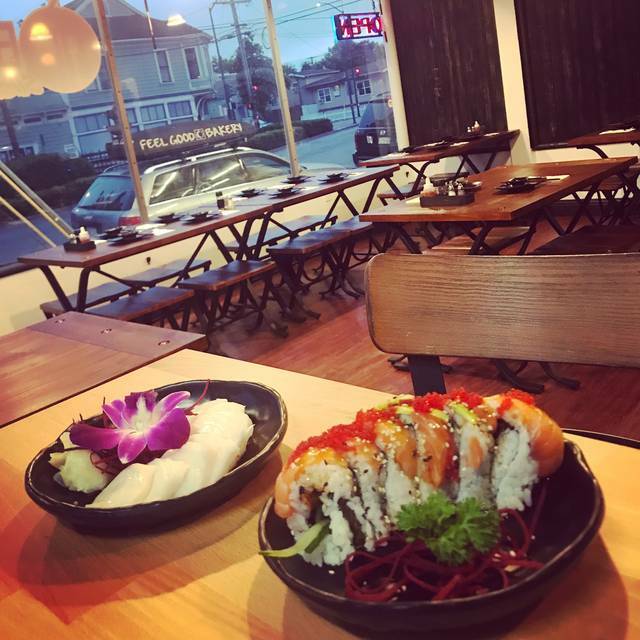 Located in Alameda, you can expect fresh sushi and delicious Thai. If you are looking for the high quality, authentic Thai and delicious Japanese foods, Bluefin Sushi Thai restaurant has everything you desire. Our foods are prepared from best selected and fresh ingredients and cooked for you by our experience chefs. From Thai menu, you will find the fresh and intense flavor of Thai herb in curry, authentic and delicious Padthai noodle and much more delightful variety dishes. Our sushi chef will serve you the exceptional handiwork, creative, healthy and pleasant-tasting Japanese dishes. Our staffs are ready to welcome you with a smile, friendly, warm and enjoyment service; we can alter the food taste for your taste bud and special request upon your need. Tofu, scallions and seaweed in a delicate Miso paste broth. Hot and sour soup with mushroom, tomato, onion, lime leaves, galangal and lemongrass. Spicy coconut – milk based soup with lime juice, mushroom, tomato, onion, lime leaves, galangal and lemongrass. Wonton dumpling in clear broth, bean sprout and scallion. Thin rice noodle with roasted duck, and bean sprout in duck herb broth. Sliced salmon, Shrimp, Spicy tuna over mix green with seaweed. Mixed garden small salad with fried tofu and peanut sauce. Grilled marinated beef with Thai spices, lime juice, tomato, cucumber, onion, cilantro, scallion bed of lettuce. Slice Avocado over Mixed greens with ginger dressing. Spicy Tuna over Mixed greens tossed with special sauce. Green papaya with prawns, tomatoes and peanut with spicy lime dressing. Grilled marinated chicken over Mixed greens with sesame dressing. Crispy spring roll stuffed with veggies served with sweet and sour sauce. Grilled chicken marinated in spices and coconut milk served with peanut sauce. Crispy golden tofu served with peanut sauce. Deep fried squid served with spicy mayonnaise. Fried chicken dumplings served with special sauce. Deep fried Jumbo Shrimp (2) and Vegetables. Rice paper stuffed with avocado, bean sprout, basil, carrot, cucumber, lettuce served with peanut sauce and sweet brown sauce. Deep fried chicken wing served with sweet and sour sauce. Thinly slice and lightly seared with ponzu sauce. Thinly slice Yellow Tail, jalapeno with yuzu sauce and red wine. Asparagus and cream cheese warp with smoke salmon. Sushi come as a pair. Shrimp tempura and crab meat. Crab meat, avocado, masago with spicy mayo and jalapeno. Spicy tuna, scallion, jalapeno with kimchee sauce. Hamachi, scallion, jalapeno and kimchee sauce. Grilled Eel and cucumber with eel sauce. Tuna, salmon, avocado, asparagus, scallion and roe tempura-style with spicy tiger sauce on top. Crab, avocado, cucumber and masago. Spicy salmon, avocado, topped with flaming salmon and ikura. California roll with BBQ eel on the top. Shrimp tempura, crab meat, masago. Hamachi, asparagus, avocado, masago and scallion. Salmon, avocado, cream cheese topped with smoke salmon. Spicy tuna, avocado and masago topped with smoke salmon, and special sauce. Salmon, cucumber, lemon with salmon and lemon on the top. California roll with salmon on the top and bake with special sauce. Crispy fried lobster and avocado, masago, asparagus with special sauce. Shrimp tempura, avocado, spicy mayo, asparagus, masago. Shrimp tempura, crab, avocado, topped with cooked shrimp. California roll on top with tuna, salmon, white fish, avocado. Spicy Hamachi, scallion, jalapeno with kimchee sauce. Soft shell crab, asparagus, masago and avocado topped with eel Sauce. Shrimp tempura, crab meat, masago topped with eel and special sauce. Salmon, crab, asparagus, cream cheese, avocado, scallion and roe, tempura-style with sweet sauce on top. Spicy tuna, avocado and tempura flakes topped with tuna and spicy mayo. Cucumber, carrot, asparagus, avocado with seaweed. Tuna, cucumber, avocado topped with salmon and crab in spicy mayo sauce and special sauce. Served with rice and miso soup. 8 Sashimi, 1 California, 4 Sushi, Mix tempura. 16 Sashimi, 1 California, 1 Bagel Roll, 8 Sushi, Mix tempura. 24 Sashimi, 1 California, 1 Bagel Roll, Blue fin bomb Roll, 12 Sushi, Mix tempura. Red curry with coconut milk, bamboo shoots, bell pepper and sweet basil. Green curry with coconut milk, green bean, eggplant, broccoli, bell pepper, sweet basil. Yellow curry with coconut milk, potatoes, onions carrot, corn. Panang curry with coconut milk, peanut sauce, citrus leaves, green bean, bell peppers, and sweet basi. Red curry with Kabocha pumpkin, green bean, broccoli, bell pepper, sweet basil. Sauteed eggplant, fried tofu, mushroom, green beans, bell pepper, basil in garlic chili sauce. Sauteed Garlic with oyster sauce, broccoli, carrot, bell peppers, and baby box choy. Sauteed beef with cashew nuts, dried chili, onions, carrots in garlic sauce. Baby spinach, broccoli carrot topped with peanut sauce. Sauteed green bean with fried tofu in garlic chili sauce. Sauteed meat with Thai basil, bamboo, onion, garlic, bell pepper, fresh chili. Sauteed mixed vegetables, fried tofu with garlic sauce. Pan-fried rice noodles with egg, tofu and bean sprouts in delicately flavored sauce. Stir fried noodles with broccoli, egg in black soy sauce. Spicy pan-fried flat rice noodles with tomatoes, onions, basil leaves, peppers and chili. Thai style fried rice with onions, tomatoes and egg. Spicy fried rice with onions, tomatoes, basil and egg. Fried rice with chicken, prawns, pineapple, onions, tomatoes, cashew nuts, raisin, egg. Stir-fry chicken with green curry paste, coconut milk, lemongrass, scallion, onion, and bell pepper. Stir-fry chicken with bell pepper, onion, carrot, scallion and cashew nut. Diced grilled flank steak with basil, lotus seed, black pepper in special sauce . Sauteed fried crispy catfish with lime leaves, green beans, bell peppers in spicy chili sauce. Salmon in creamy red curry sauce, bell pepper, lime leaf. Grilled Salmon served with spicy lime sauce. We drove all the way there from Santa Cruz County, had "reservations" and the place was closed with a sign saying it was under new management; dark with chairs upside down on the tables. Who knew? Enjoyed this spot and the spring roll was excellent. Liked that there were Thai and Sushi options. Good customer service as well. Good selection of sushi and Thai. Tried some of each. Good value. A small casual restaurant with extensive menu. New mgmt but same menu; mix of Japanese/Thai. Chicken gyoza surprisingly good; octopus sunomono very good. I'd skip the BBQ duck w/rice plate next time; just ordinary. Pad thai heavy on ketchup but sadly fried tofu seemed stale. Option of shrimps or meat available. Maguro and hamachi sashimi were good quality, commensurate with price. Bluefin is a budget Asian restaurant; a simple place appreciated by locals. Don't expect top-flight Asian; this is a value place. Bluefin Sushi Thai did not have any record of our confirmed Open Table reservation. We arrived 5 minutes early for our 6:15 reservation to find the small restaurant full, with no available seating for the entire night. They had no record of our reservation, though I showed the manager the confirming Open Table email I'd received. This is the first time that Open Table did not work as advertised. May it be the last. Food was excellent! Very small restaurant so reservations were a must. Will definitely return if we are in the area. Despite living in the neighborhood for years and driving past this place multiple times weekly, we never went in, for one particular reason I'd rather not state. Seeing the recent change of ownership, and my wife hearing from a trusted friend that it was pretty good, we gave it a shot. The service was kind of slow even though they weren't that busy, but they were very friendly. The ambience is not what you would expect from a sushi place, somewhat of a old school burger joint feel. But what they lack in those areas, they make up for in quality of food and value. We'll be going back. A small neighborhood establishment located in a small shopping center. The wait staff were friendly and helpful. We were surprised at the extensive menu, they serve sushi, Japanese and Thai. We ordered several Thai dishes, which we throughly enjoyed. They serve, beer, wine and sake. Our visit was on. Friday evening, and we were fortunate to be take advantage of their Happy Hour. We will definitely return. Chose this place because they serve Thai and Japanese dishes. It's not a fusion which is the way I actually prefer, because I was craving Tom yum soup but I also wanted to have sushi. The service is great, they adjust spiciness levels to your preference and the waitresses are patient and kind. The food is good as well. I loved the Tom yum, it hit the spot. Also ordered the sushi boat, gyoza, and red duck curry. They're well portioned at a good price and presented beautifully. I will definitely be back!